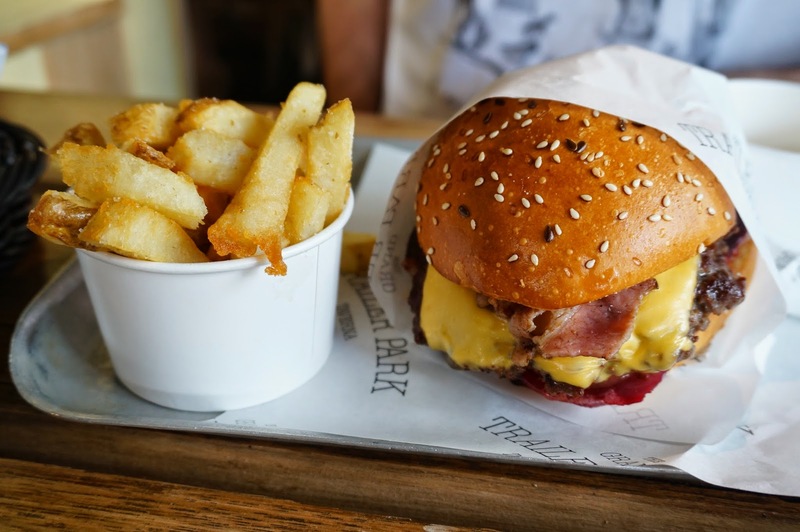 While most fads of Melbourne die out, the burger reigns supreme to this day. Grand Trailer Park Taverna is in the heart of the CBD in an highly unlikely spot, above a 7-eleven. Don’t let that worry you though, as soon as you step in, you are transported to America in all it’s trailer-trash-chic glory. There are caravan shells which have been gutted and replaced with communal dining tables, and wooden cubby houses with bar tables and stools. The service counter is decked out like a diner, and the floor is synthetic turf. 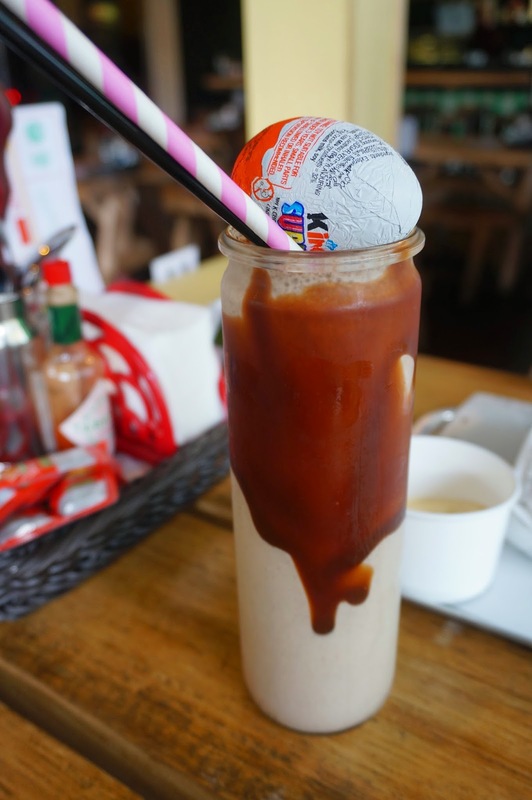 Kinder Surprise, Frangelico, Baileys ($21.0) Yes that’s the real price, and yes that’s a real Kinder Surprise, but the size of this drink is crazy-huge, and crazy-thick. One of the best milkshakes I’ve ever had, and the smooth way the alcohol was incorporated into the drink made it utterly delectable. I cannot wait to try every single flavour on the menu. Premium Aussie beef pattie, American cheddar cheese, chilli cheese kransky, crispy bacon, BBQ sauce & truffle cayenne mayonnaise on a lightly toasted brioche bun ($16.5) + Hand cut chips (sml $2.8). 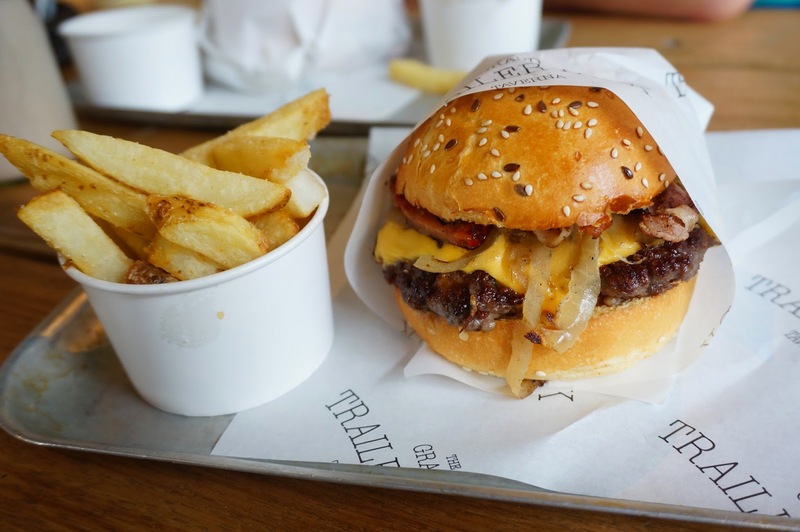 I really, really love cheese kranskys, and so of course I chose this burger. It was like a triple meat stack attack. So great. The chips were pretty amazing too, thick chunky potatos fried to a crispy batter. Pro tip: ask for some truffle cayenne mayonnaise dipping sauce, and the experience is even better. Premium Aussie beef pattie, American cheddar cheese, crispy bacon, black Russian tomato, sliced beetroot & tsar burger sauce on a lightly toasted brioche bun ($16.5) + Hand cut chips (sml $2.8). This burger was definitely the star of the day, and it was all in the tsar burger sauce – finely chopped pickles in a creamy tangy sauce. It made the burger sloppy and so tasty. I’d get this again in a heartbeat. These artery-clogging Nutella Donuts – 3 fresh nutella filled donuts coated with sugar ($9.5) were pretty amazing. 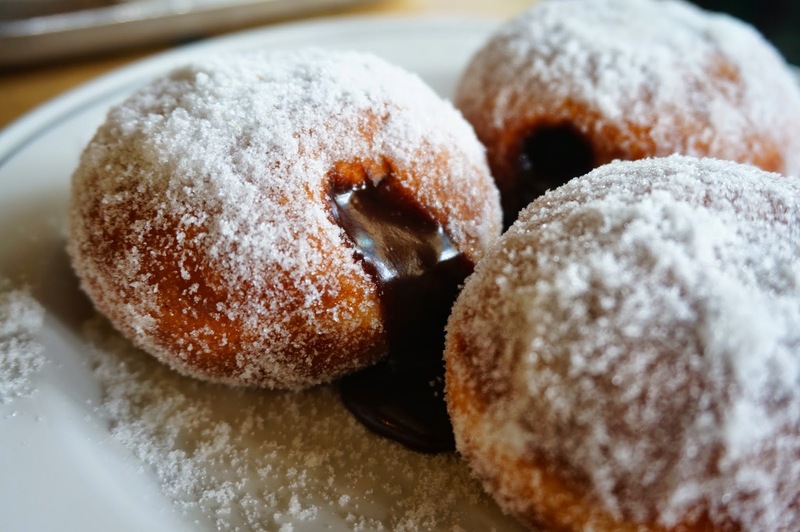 The explosion of runny nutella and the traditional sweet donut were a great way to finish the meal off. But next time, I’m choosing waffles!